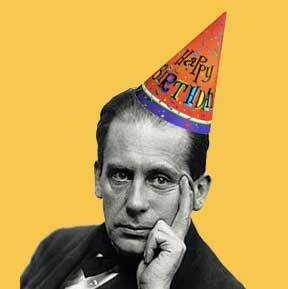 The day that Walter Gropius was born. Let’s see, how many years ago was that? 134 years. Gropius was an architect. He was not very good at drawing but he had BIG and NEW ideas. His first job was with an industrial designer, followed by starting his own firm with a partner, Adolf Meyer. During this early period, he designed some important and significant things, including the facade of a building (not the whole building) and also a locomotive – both which put him on the map as one of the early Modernist designers. After fighting in WW1, Walter Gropius joined the Arts and Crafts school in Weimar Germany. 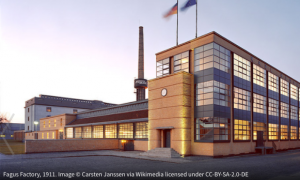 Once he became the head of this school, he transformed it into the Bauhaus, a famous German school of architecture and design, credited a s one of the most influential modern design schools. It was significant because it designed beautiful and functional items for everyday people. Whereas in the past, only people with wealth had beautiful objects, the Bauhaus designers had a new kind of philosophy to bring beauty to functional objects for all people. Because of Naziism in Germany in the 1930’s, the Bauhaus was forced to close. 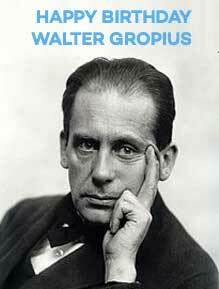 Gropius and his family left the country and moved to Great Britain and then to the United States. He taught at Harvard School of Design and collaborated on many design projects. This facade design was one of the first projects that Gropius worked on in Germany. The Fagus Factory was very unusual for the time period, for the exterior wall made of glass.